This past week I have been taken by the scriptures at Lauds each morning. Throughout Lent we read the Exodus journey from the escape from Egypt to the Promised Land. The Israelites are just escaping Pharaoh and the 10 plagues are over. Moses and the people are in the desert wandering around. It is a good image for us in Lent. These days are our wandering around as we await the promises of Christ we celebrate at Easter. I long ago decided wandering is just fine and an okay place to be! It is in the wandering that we are able to sort, sift and come to terms with the essence of life. What is it we are about? How is our faith in God? How do we bring Christ to the world? What are our temptations? How do we know what the Lord desires for us? Can we accept it? The Israelites are discerning all these things with Moses in the desert. They go through high praise of God and low times of ignoring Moses and God’s Word. They must, we shall see in the coming readings at Lauds, make a decision about how they will live. When they do then the Promised Land appears. Discernment is all about wandering, reflecting on life experiences and what obstacles arise to our doing as God wants of us. It is also about discovering, in deeper prayer, what it is God does want of us. We are working with several women who are discerning. They are wandering, and not yet sure what God wants of them. But they are reflecting on their experiences, sharing them with me and arranging to come spend time with our community. Some have visited before and are returning to learn more about us. The point is that wandering is good if it is grounded in prayer, reflection and, often, discussion. The Israelites are our model. Moses led them in prayer, reflection and discussion to clarify the people’s relationship with God and what was expected of them. 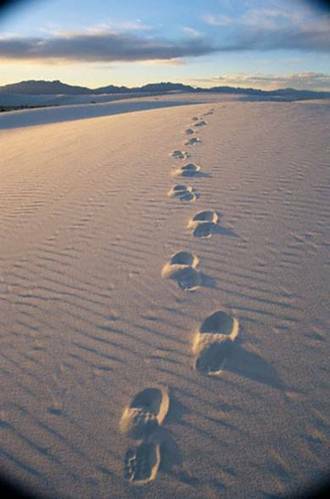 The Israelites’ journey might make some good reading for your discernment time during Lent. Wandering right know doesn’t seem like it’s much fun. Hi Pamela. Wandering isn’t really all that fun. You make a very good point. Sometimes I think wandering does help us find our priorities and forces us to take more time to listen to where God is leading. When I feel like I am wandering then I know it is time to pray and listen more intently. I often refer back to the Israelities time in the desert, wandering and waiting to find the Promised Land. In their wandering the became more committed to God, they became more bonded to each other and, eventually, found their way to God. It just took them awhile and a lot of work. I also refer back to Jesus in the desert, facing the temptations and knowing where His heart focused. He could really only do that in the quiet and aloneness of the desert – where his full attention was on God’s message for His Life. Then he could leave the wandering in the desert and find his way to Jerusalem. The fun comes when we have clarity about where we are to walk with God and are able to go forward and not wander.